The Port of Hood River, a public agency, has owned and operated the Hood River/White Salmon Interstate Bridge since 1950. The 4,418’ steel truss bridge was originally constructed in 1924. It provides a critical, bi-state transportation link between White Salmon and Hood River. Unlike most state or federal transportation facilities, the bridge is locally owned and funded wholly by its users, in the form of a toll. The Port is responsible for keeping the bridge safe and operational. It is also working as the lead agency in planning for the construction of a replacement bridge, expected to cost over $250 million. Tolls will continue to play a critical role in financing the maintenance and capital improvements required to maintain the existing bridge, and in the ultimate construction of a new, replacement bridge. Bridge engineering firms HDR and Stafford Bandlow have developed near and long term work plans for the bridge that identified future capital projects, inspections and repairs, and specific costs. This 30-year Work Plan informs Port budget planning and contracting. The Work Plan anticipates more than $51 million in capital upgrades, maintenance and repair projects in the next fifteen years. 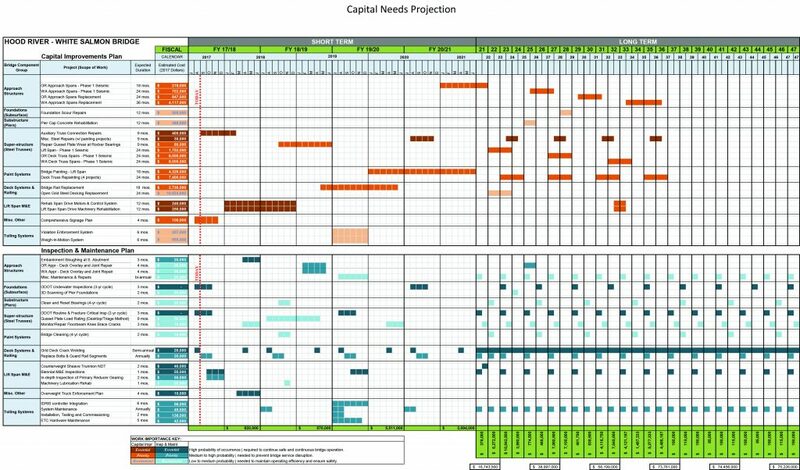 The matrix below is a visual representation of the Work Plan. Click the image to download the PDF version of the work plan. The bridge has been a toll facility since its construction in 1924, when the base toll was 75 cents per vehicle (see the History of the Hood River Bridge page for a chronology of rates). Since that time, the base toll rate has never been over $1 for passenger vehicles. Now, the Port finds that annual toll revenue at the current rate is insufficient to fund the expected costs to maintain the aging bridge structure. And, significant new costs for the development of a replacement bridge are anticipated in the short term. After two public hearings and multiple presentations to governing bodies and public interest groups on both sides of the river, the Port Commission approved a toll increase on December 5, 2017, to take effect on February 1, 2018. The 2018 toll rate structure provides BreezeBy customers with a 50% discount from the cash rate. This provides frequent, local bridge users a strong financial incentive to set up a BreezeBy account, and the BreezeBy lanes provide the quickest, easiest trip through the toll plaza. The Port has implemented a new online BreezeBy customer account management system that enables customers to open an account online and receive their transponders in the mail, avoiding the need to visit the Port offices during business hours. There are no fees open an account, and each household receives one transponder for free. After that, each additional transponder is $5.00. The Port anticipates significant new demand for new BreezeBy accounts as a result of the toll increase, but customers should still expect to receive their new transponders in the mail within 2-3 business days, depending on the volume of orders. The new toll revenue is expected to provide between $1.7 and $2.2 million in additional annual revenue. All net revenue from a toll increase would be dedicated solely to bridge repair or replacement. On June 15, 1993 the Port established a Bridge Repair and Replacement Fund (“Bridge Fund”) to finance studies, engineering, repair projects, and replacement efforts. Then on October 18, 2011 the Port again increased cash tolls to $1 and increased the electronic toll to $.80, with those funds also dedicated the increase to the Bridge Fund. Since the fund was first established, revenues derived from the toll increases have been limited to (a) payment of Bridge expenditures, including capital projects, maintenance, operations (including direct and overhead expenses), equipment, reserves, financing costs (including debt service), and expenses to promote mass transit use of the Bridge, and (b) expenses associated with borrowings and any bond covenants. All revenue raised from this increase will have the same restrictions.